Teams: Tahlequah, Owasso, Union, Broken Arrow, Vinita, Booker T. Washington, Skiatook, Mannford, Miami, Inola, Keys, Adair, Hakell and Collinsville. 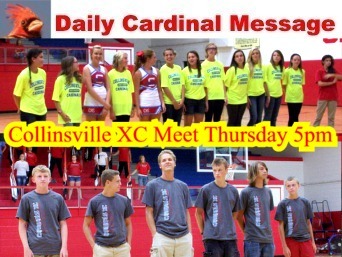 2013 Collinsville JrHi Girls Cross Country Team -- (L-R): Carley Del Monte, Ava Rigdon, Hailey Wilson, Grace Coleman, Zoe Vogel, Abby Stacy, Carrington Buoy, and Alex Stewart. 2013 Collinsville JrHi Boys Cross Country Team -- (L-R): Ethan Thomas, Branden Little, Colby Barker, Chase Curtis, and Zach Madole. (Above L-R) Taylor Glenn, Kayce Thetford, and Coach Kim Myers were assisting with all the races. (Right:) Ellen Thomas (#2319) had a few runners ahead of her but many more behind her in this view before finishing 5th. HS Boys after the first turn in their 3.1 mile race on the course over the soccer fields and behind ECC & Herald. 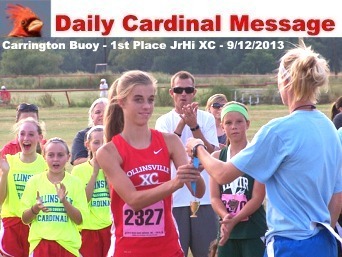 Early in the JrHi Girls race (L-R in red) Zoe Vogel finished 6th, Abby Stacy 11th, and Carrington Buoy 1st overall. Carrington Buoy (cheered on by Coach Myers) finished well ahead of the field in the JrHi Girl's race with a time of 6:58 in the one mile race. CHS Girls with their 3rd place team plaque. Collinsville JrHi Girls with their 3rd place team plaque. Ethan Thomas (left) got a medal for his 12th place finish in the JrHi boys race. Tue. Oct. 15 METRO Conference - T.B.A. at T.B.A. Sat. Nov.16 OK-AR All Star at Rogers, AR T.B.A. Tue. Oct.15 Metro Lakes Conference at T.B.A. T.B.A. * JrHi girls 3rd (with Carrington Buoy 1st individually). Dylan Dyer had the 4th place finish in the HS boys race. Coach Eric Dutton provided last minute instructions to the JrHi boys before their race. Jayden Howerton is new to the CHS boys team since the team photos were taken in August.